STOP HS2 | HS2 Ltd display a complete inability to do simple maths. HS2 Ltd display a complete inability to do simple maths. 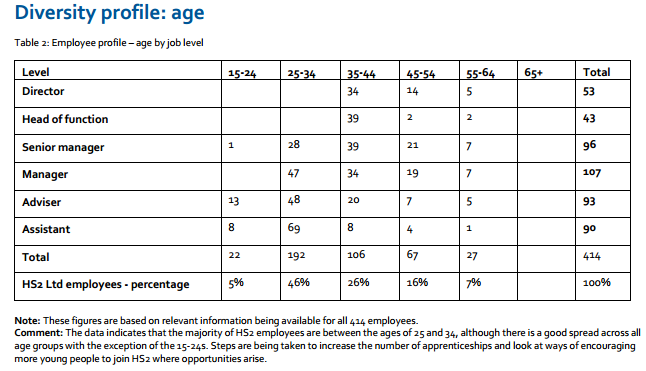 HS2 Ltd have published their workforce report, a pretty standard sort of document for a Government department, it is basically their diversity monitoring report. The other thing that is pretty standard, as it comes from HS2 Ltd, is that it displays an unrivaled incompetence when it comes to simple maths. Not hard maths, just adding up small numbers. In fact they are exceptionally small numbers, compared to the exceptionally large big numbers with pound signs in front of them that HS2 Ltd have been trusted with. There is nothing massively out of the ordinary until you reach the data tables. The only thing which really stands out in the first one about gender is the number of directors within the organisation, which is apparently 22. This seems slightly higher than expected, especially as only 11 directors are listed on the front page of their website, though for some reason that list does not include Chairman Sir David Higgins. Whilst the HS2 Ltd website gives biographies for 5 female directors and 11 directors in total, according to the monitoring table there are only 4 women on a board consisting of 22. However, this is small beer, a mere appetiser for the information contained within the table of age profiles. By the time you turn the page to the age survey, there are now 53 employees at Director level. Yes, 53 directors! Well we knew they were on a recruitment drive, but we didn’t expect it to be achieved quite this quickly! On top of that, instead of there being 7 heads of function as in the gender tables, there are now 43. But the key thing is that whilst the notes say that, like the gender breakdown, the data was based on responses from 414 employees, the total actually adds up to 482. Whether you add up the row of totals, or the column of totals, or just all the figures, it comes to 482, no matter what the notes or the box that has 414 in it says. Come on! You had to enter this data onto a computer spreadsheet, the computer could have added it up for you. But no, clearly someone thought “I don’t need the computer to do this ridiculously simple maths, I can do it” and they spectacularly failed. Getting this so obviously wrong and not one of those 46 staff who are paid more than the Prime Minister spotting it before it was published, is an extra special type of completely bloody hopeless. Whilst the notes for religious breakdown claim the figures are based on the responses of 340 staff, the numbers contained in the table actually add up to 344. Well, 344 if you add up each individual figure, but only 343 if you add up the published totals. The reason for the difference between the 344 and 343 is contained in the count of the Hindu staff at HS2 Ltd, as some genius came up with the superb maths that is; 4+4+3+4=14. Earlier this year, then 9 year-old Alex Rukin went to Parliament pointing out that he had spotted HS2 Ltd are terrible at maths. With all certainty, he would have got this one right at half that age. For anyone reading this from HS2 Ltd, that’s 4½. You really have to wonder how on Earth such a document could possibly get released into the public domain. Seriously, did no-one check this before it was published? Though in fairness, the maths part of their brains was probably too worn out from trying to count their wages. It really makes you feel that that £50.1bn £55.7bn of public money is most certainly safe in their hands and all their budgets are robust. Doesn’t it? HS2 figures not adding up? Perhaps numbers have been adjusted for inflation at 2011 rates?